Antioxidants are a popular health supplement, and for good reason: They’ve been used to treat a wide array of conditions, ranging from arthritis, to Irritable Bowel Syndrome, to insomnia and even to depression. Because of this, you have to be sure you’re getting the best antioxidant option. That’s why we wrote this review of Nature Made Turmeric Curcumin: To help you judge if it is a good choice of supplement for you. The only ingredient listed in Nature Made Turmetic Curcumin is its namesake: Turmeric. 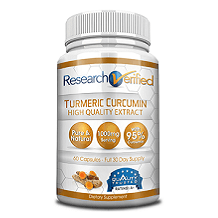 This is a substance which is derived from the Curcuma longa plant, native to India. Turmeric is routinely used in herbal health supplements and treatments because it is believed to possess a great deal of antioxidants, which will help a number of conditions, including arthritis and other anti-inflammatory diseases; depression and anxiety, as well as sleep disorders; cardiovascular disease; Crohn’s disease, and Irritable Bowel Syndrome, as well as many others. It should be noted, however, that to be made accessible to your body tumeric may requires an additive. This product appears to have no such additive. The dosage for this product is fairly simple. It states that, to benefit from this product, take a single capsule per day. You may take this product at any time of the day, so long as it is with a meal. While not exactly side effects, there are three issues that you should watch out for: Diminished drug effectiveness, reduced supplement effectiveness, and impaired drug/supplement absorption. The first two mean basically the same thing: You won’t receive the same effects from your medications and supplements as you did before. The last means that this medications or supplements won’t be absorbed properly. This product also has a few caveats on who should use it. If you are pregnant or nursing, this product should be avoided. Likewise, if you have a history of gall stones or bile duct obstruction. Taking this Turmeric before surgery could be dangerous, as it can result in excessive bleeding. 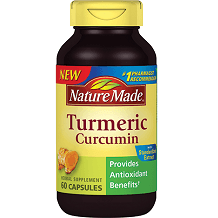 At the time of our review Nature Made Turmeric Curcumin was available in a 60-count bottle for $8.54. The manufacturer does not sell the product through its own website. The company seems to have a straightforward and customer-friendly return policy. “If you’re not satisfied with our product, we’ll refund your purchase”. However, beyond that, you have to fill out a form on their website to learn the details. It’s not clear if they accept opened product or not. It is certainly true that Turmeric can be used to treat quite a few health complaints. It is also true that, while reviewing Nature Made Turmeric Curcumin, we found that it contained this ingredient. And there’s no arguing with the very low cost. Perhaps the greatest recommendation is the hundreds of Amazon customer reviews with an 84% positive versus 8% negative ratings ratio, an excellent ratio. However, the product seems to be missing a few important things. The first being an additive that makes it useful to your body. Without that, it may be nothing more than a placebo. Its return policy, while potentially very good, is not available in detail and we don’t know if you can test the product’s effectiveness and then return it.